Aaryn works as a behavioral support staff for Kalamazoo Public Schools. He is a husband, and father to his own children and a father figure to many youth throughout the Kalamazoo community. His passion for youth can be seen through his involvement in positive recreational leadership development programming. 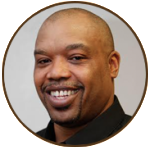 He currently serves as a coach and mentor for the Kalamazoo Legends AAU Basketball team, runs a community based winter basketball league, and founder of the annual four day basketball tournament held at LaCrone Park. He uses his experience and expertise of being a certified referee to guide and train young men and women who want to become referees. Aaryn’s involvement with youth at a young age instilling and developing foundational skill has had a tremendous impact on youth in the community. Several of these youth have gone on to be successful in different areas; such as youth who were a part of winning back to back Class A MHSAA Basketball titles, and being recruited to college. Aaryn is looked up to by several youth in community as a positive role model and someone they can relate to. This summer Aaryn will be Co-Commissioner of the Charlie’s PLACE Youth Basketball League.